Land mines are small, passive defense systems that explode when enemies come closer than 2.5 tiles of them, dealing 300 damage and stunning enemies for 3 seconds. Land mines can be placed freely on the map. They deal enough damage to kill small/medium enemies or unarmored players outright, but will only injure and stun larger enemies. Land mines do not damage allied buildings or players. After placing, land mines take 2 seconds to arm and bury in the ground. During those 2 seconds, they are visible to enemies and can be destroyed by biters or directly shot by enemy players. After burying, enemy land mines can only be destroyed using weapons with area damage, for example grenades or the flamethrower. 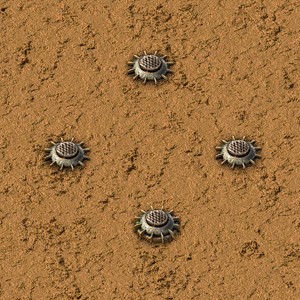 Land mines are the only passive defense in Factorio; if an alien is hit by a land mine, they will not start chasing the player. Enemy mines are not completely invisible anymore in PvP scenarios. Land mines now also stun enemy players. Explosive mine now only does damage to enemy units and structures. Increased the damage of the explosion significantly. Optimized the land mine activation code. Land mines can be rebuilt by construction robots. Land mine now has a larger damage and trigger radius. This page was last edited on 20 January 2019, at 11:54.